Its been no secret to anybody with even a basic grasp on reality that the global financial problems are far from over, despite the propaganda we are routinely fed by “The Matrix“, and anybody paying attention would know that things are progressing pretty much exactly as laid out by Gordon T Long in early 2010, see image below, click for full screen. A Greek default is not a matter of “If” only “when”. Every bank in Greece will instantly go insolvent. The Greek government will nationalise every bank in Greece. The Greek government will forbid withdrawals from Greek banks. To prevent Greek depositors from rioting on the streets, Argentina-2002-style (when the Argentinian president had to flee by helicopter from the roof of the presidential palace to evade a mob of such depositors), the Greek government will declare a curfew, perhaps even general martial law. The New Drachma will devalue by some 30-70 per cent (probably around 50 per cent, though perhaps more), effectively defaulting 0n 50 per cent or more of all Greek euro-denominated debts. The Irish will, within a few days, walk away from the debts of its banking system. The Portuguese government will wait to see whether there is chaos in Greece before deciding whether to default in turn. A number of French and German banks will make sufficient losses that they no longer meet regulatory capital adequacy requirements. The European Central Bank will become insolvent, given its very high exposure to Greek government debt, and to Greek banking sector and Irish banking sector debt. ..So the dominos look like starting to fall very shortly, and of course in these situations Gold (& to a slightly lesser extent Silver) do what they always have, protect your wealth. …Interesting times indeed, are you ready? 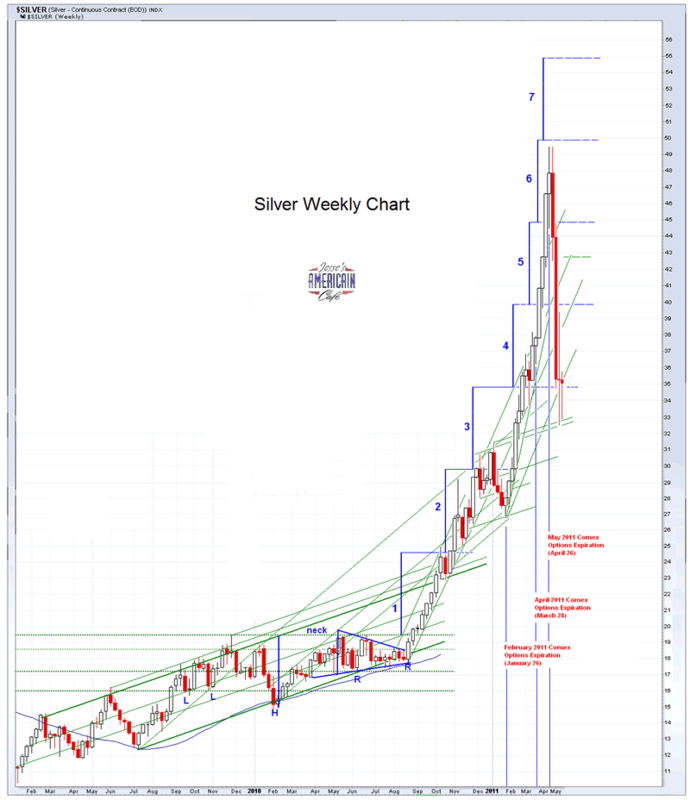 Timely article below from one of the best metals commentary sites on the web. “We now know that there has been a dramatic reversal in world central bank thinking, and instead of selling gold as they have been doing, world central banks, on balance, are buying gold. We know that China, Russian and many Asian countries are urgently increasing their gold-to-reserves ratio. But more powerful than anything else will be the trend of the stock market. If the bull market dies here or even if it corrects severely, the pressure will fall heavily on the administration and the Congress. For this reason, I expect the rest of the year 2011 to be ‘wild and wooly.’ I expect government lies and propaganda to reach a crescendo. I’m bracing myself for a parade of surprises. Politicians love power and perks. But to keep those two, they must also keep their jobs. Therefore, coming up, I expect an extreme in dirty politics and internecine political battles. There was a remarkable divergence in the markets today as gold rallied sharply, dragging silver behind it with a lag, while stocks headed lower. The impetus was clearly the Greek debt decision by Fitch, as the markets moved right with the announcement, breaking up the usual option expiration shenanigans. Let’s see how this progresses next week. This breaking of the mold will likely not continue without interruption, since old tricks die hard. But it may be a portent of things to come. Great events and changes are in motion. 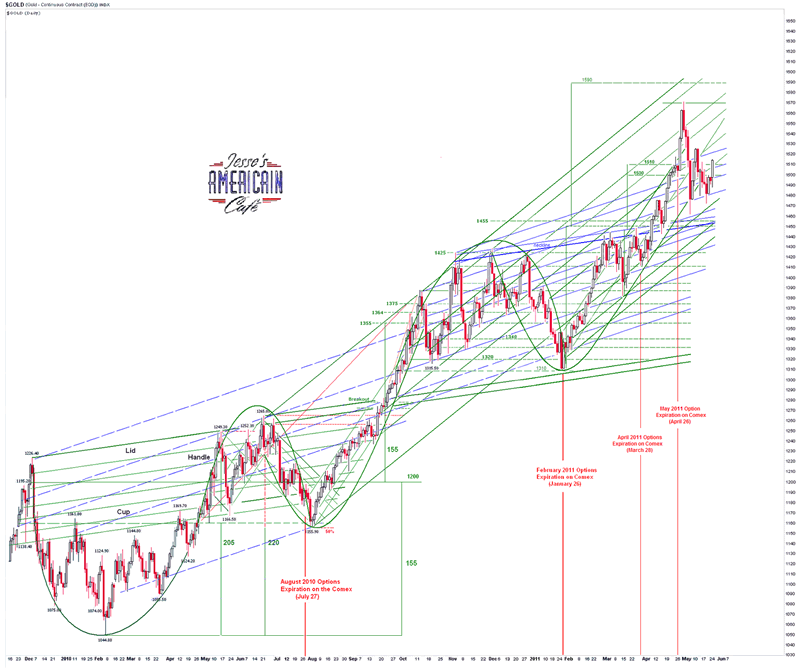 Welcome to Jesse’s Café Américain – These are personal observations about the economy and the markets. In providing information, we hope this allows you to make your own decisions in an informed manner, even if it is from learning by our mistakes, which are many. Debts, Deficits, Dollar Collapse, Yea Whatever..
Are Gold & Silver Away Again? – We Think So.. The Biggest Fraud in History?